In a small bowl, combine cream cheese, sugar, flour and vanilla. Set aside. Pop open crescent roll dough and unroll, leaving crescents in rectangles. On an ungreased baking sheet or silpat, lay the crescent roll rectangles together, lining them up width wise. Dough should be almost the entire length of a half sheet pan.Press edges together to even out edges and seal any holes. Cut 1/2 inch diagonal strips up each side of the dough. Carefully spread cream cheese filling down the center of the dough to be about 2-3 inches wide. Top with fresh blackberries. Bake for 15-20 minutes or until filling is set and crescent dough is golden in color. Cool before removing from baking sheet.Once danish has cooled, remove to serving platter. In a small bowl, mix together powdered sugar, vanilla and cream to create icing. You may need to add more cream to get the desired consistency. 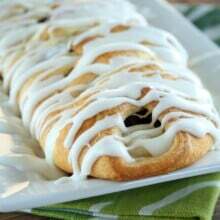 Drizzle icing over danish. Cut into pieces and serve.